I began my life in Purebred Dogs back in the 60’s with Alaskan Malamutes. Several years later I delved into Siberian Huskies and Akitas. 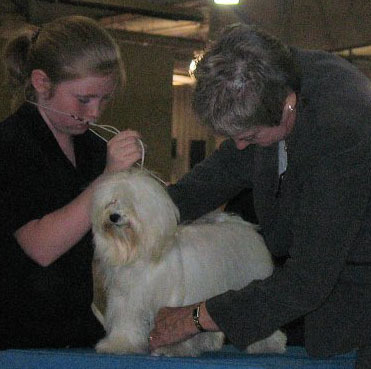 In those three breeds, I produced over 100 champions, several top ranked dogs, and two All Breed Best-In-Show winners. I received approval from AKC for Akitas and Alaskan Malamutes in 1990. I am currently approved for Best-In-Show, Working Group, several Non-Sporting breeds, Australian Shepherds.... and Havanese. Nine years ago my first Havanese joined our family. It wasn’t planned. My husband said “I must have that puppy” and Derek (Ch Top Secret’s Yankee Short Stop, RN) came into our lives. Traveling as we do for judging assignments, I felt bad leaving Derek home alone (with dog walker visiting several times a day) so we found a little girl Havanese to keep him company and Joy (Ch Harbor’s Yankee Doodle Joy) also joined our little family. Recently we added a third fur child.... Los Ariba’s the tip of the Sword... Sabre. 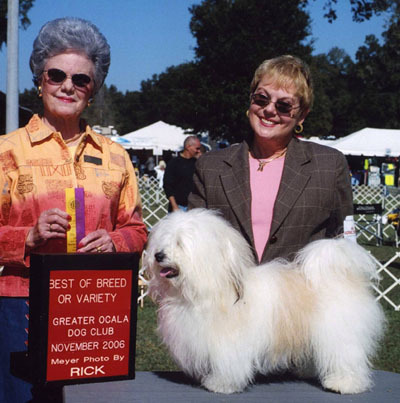 I don’t consider myself a breeder judge, although I have bred two Havanese litters. We placed all the pups in pet homes. I worry to obsession about finding the right homes for my puppies so I won’t breed again. Judging Havanese can be challenging. There is little consistency in type and every one of them is so darn cute. I am aware that “cute” is not mentioned in the Havanese standard, but “Charm” is. Mentioned or not... Havanese are cute. I want to give them all (or most of them anyway) first place. I just love EVERY single one of them. I have been fortunate that most of my judging assignments offer many of good quality, and some excellent. That being said, the first thing I look for as I view a class is correct Havanese outline: Head; topline; that “teacup handle” tail arched over the back; coat; and first and foremost...balance, meaning angles, front to rear, proportions head to body and height/length. The total picture. I then move the class around the ring. Again I assess those same attributes in motion. A capable handler can stack a dog to make him appear to have certain qualities, but in motion the real dog becomes blatantly clear. I am also looking for the spring off the front assembly resulting from a relatively short upper arm. Individual examination is exactly that; an examination. I am looking at the finer points; I approach from directly in front assessing expression, head/muzzle proportions, set-on of eyes and ears, eye, nose and lip pigment, and bite. I feel for a solid, athletic body beneath the silky, double coat, feeling exactly where the depth of body/brisket ends. Down the front legs to feel for “straight” and moderate boning. As I examine the body, I want to feel a sturdy dog. I check length of loin, as I want a longer rib cage and shorter loin; set on of tail and muscle mass in rear (testicles in males). I also get a feel for temperament during the hands-on examination. I will forgive a certain amount of shyness and lack of training/experience in a puppy, but not an adult. Puppy classes are for puppies. Other classes are judged as adults. If your dog isn’t ready to be judged as an adult, enter the puppy class or wait ‘til he is ready. After the hands-on, I move the dog straight away and back, as this is part of the examination process. As with the hands-on examination, I am finding things that are ticking boxes, positive or negative. Coming from Working breeds, I am acutely attuned to structure and movement. It is interesting to me how structure affects movement; how what I felt in the examination shows true in movement, or not. Sometimes I am surprised. A dog will move better or worse than I expect. The short upper arm thing is fascinating. Breeding for it AND keeping overall balance is challenging; as is evaluating it from a judge’s viewpoint. I look for strong parallel rear pasterns. Coming at me I want to see clean elbows, not turning out, nor coming in under the chest. Although with correct movement both front and rear legs will tend to converge, they should present straight lines from shoulder/hip to foot. Straight line thru elbows/hocks, not single track, as their legs are too short to offer that much convergence. Then around to the end of the line. Here is where much of Havanese-specific/type movement is to be evaluated. On the lateral, I can see how the structure affects the movement. The topline should hold a slight incline towards the rear as he moves. He needs balance of angles, shoulder to hindquarters. The front should reach, but not as much as the rear drives. So now we see how the short upper arm “unbalances” the balance in movement. The dog must “re-balance” his movement in order to have proper foot timing. So how does the dog “re-balance?” This is where the “spring” off the front end comes in. He must spring his front end in order to TIME the footfall so the rear and alternating front foot hit ground simultaneously, and the rear foot falls where the front one fell before. Complicated? ABSOLUTELY!! When examining and moving each dog individually, I am mentally ticking boxes... I “like” this point... that point not so much. When all dogs in the class have been examined, I have to mentally go over that list of “likes” and “not so much” in my mind. The dog who has more “likes” and fewer “not so much” wins... The difficulty lies in weighing the “likes” for each dog against the breed standard, and what I have learned as being more or less important. Breed type is number one for me... breed type both standing and in motion, as I interpret from both the written standard, the six critical elements of breed type, and having been educated by my mentors. When I am judging, several things come in to play. Grooming! Too many handlers over-groom. The sad thing is that too many judges like it. I will give a win to an overgroomed dog in spite of the groomer error, but not because of it. I want to see a dog presented clean, brushed, and moved on a LOOSE lead. You can’t see that required spring of gait if the dog is strung up. What positives do I consistently see in the Havanese breed? CUTE!! LOL... Excellent temperament. Beautiful coats, some more silky, some more “fluffy”, but soft and flowing. Havanese are sturdy dogs, properly boned and muscled. The presentation of the coat is important. The Havanese standard calls for the coat to be soft and light in texture. It stands off the body slightly and flows with movement. There is function to this coat and presentation. The coat has a purpose; to “shade” the dog from the sun (Cuba is a very sunny country) light and loose, i.e., fluffy to shade the dog and allow air to circulate through the coat to help keep the body cool. Dogs who are presented with the coat brushed down, similar to a Maltese or Lhasa, do not allow the purpose of the coat to be apparent. What negatives do I see too often? No consistency in type. Long heads, close set eyes. Level toplines. Lack of a springy gait caused by a short upper arm. Too many judges are rewarding dogs with balanced length of bones, front to rear. These dogs are very flashy and cover ground like a working dog. The standard calls for the upper arm to be shorter than the correlating bone in the rear assembly. The front/rear should not cover ground the way too many do. 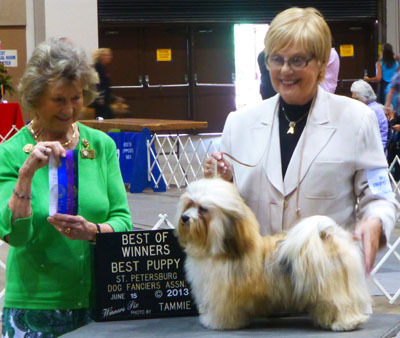 Thank you for allowing me this opportunity to talk about judging one of my favorite breeds, the Havanese. The Ring Steward says "You can now go back to the Judges Education Section!" We invite Judges to learn from more than a Seminar providing approved judging seminars with photographic examples of movement, structure, and breed type plus breed mentors to assist by email or phone.